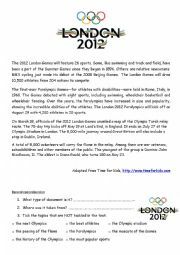 A reading comprehension about the next Olympic Games which will take place in London. I hope you´ll like it. Hi! 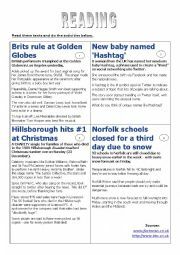 This is a reading comprehension (4 short articles) with different activities (matching, classifying, true or false...) I hope it will be useful! 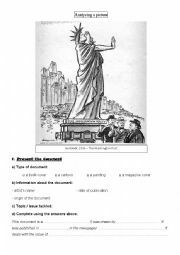 A worksheet to analyse and describe a picture for students who have difficulties. Three pages. I hope it will be useful! 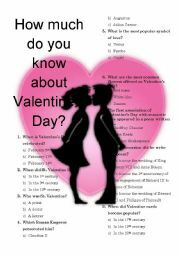 This is a quiz I made for my students for Valentine´s Day. The solutions are on page 2. Hope you like it! A Calvin and Hobbes comic strip about bullying. 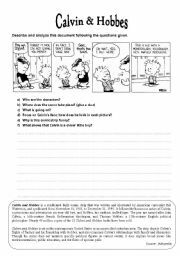 Students have to describe and analyze it using the questions given. 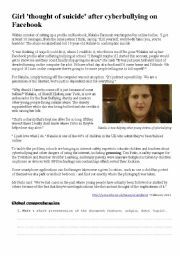 an article about bullying, with activities. Hope you´ll like it! 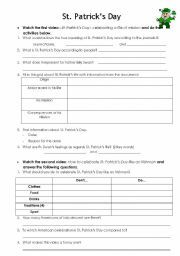 This is a worksheet for two videos on St Patrick´s Day. The first video is about St Patrick´s life and the second one is a funny one on how to celebrate this day. You can find the first video here: http://www.youtube.com/watch?v=NkjjXgSKMfs and the second one there: http://www.youtube.com/watch?v=mH0TjR9tmPg Hope you´ll enjoy it! 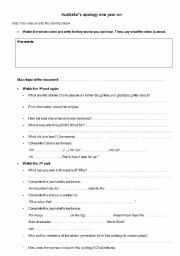 This is a worksheet to study a video about the stolen generation in Australia. You can find this video by following the link below: http://www.youtube.com/watch?v=hp5w1Zp0-vQ Hope you´ll find it useful! 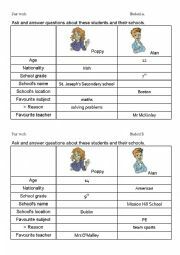 This is a pair work to make the students revise easy questions (what, who, where) on the theme of school. Hope you´ll like it! Hi! This is a powerpoint I made for my students to practise speaking about environmental issues. I hope you´ll like it and sorry if there are problems with it: originally it was a .pptx file so changes may have occurred.